This webinar has ended - but don't worry, we have you covered! We've turned "Reach More Clients with World Wellness Weekend" into a course with free & unlimited access. To gain instant access to the entire recorded webinar, presentation and other resources click the button below. This webinar is organized especially for wellness travel related businesses who are seeking new ways to strategically collaborate, work with wellness influencers, develop strong relationships within their own communities and position themselves as wellness travel leaders. Seasoned marketing executives from 3 iconic properties will share why they are involved in World Wellness Weekend, what creative activities they will organize for their guests & associates and give webinar attendees practical ideas, tips, and advice so they can join this global wellness event on Sept 22-23, 2018. 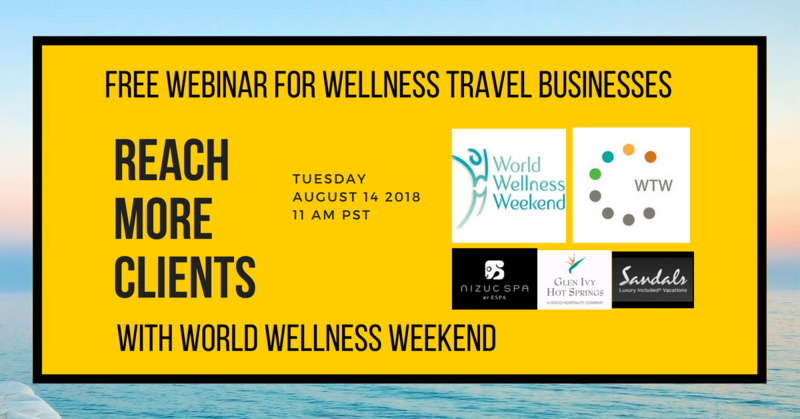 Co-hosted by Camille Hoheb of Wellness Tourism Worldwide & Jean-Guy de Gabriac, founder of World Wellness Weekend, our guests include marketing pros from Sandals Resorts, Glen Ivy Hot Springs and NIZUC Resort & Spa - Grupo Brisas. Complete the registration form below and you are on your way to better marketing, promotions and partnerhships for your wellness travel business! Which best describes your professional role? Click here to learn more about World Wellness Weekend.